PROTECT YOUR ELECTRICAL INSTALLATION & ELECTRICAL DEVICES. 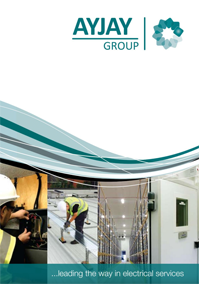 We can install different types of arresters ideally suited to all industrial and commercial environments. An electrical power surge can affect a property at any time posing a risk of fire or damage to electrical devices and systems within your business. This can be in the form of a lightening strike, an electrical surge from the distribution network or an electrical overload from machinery within the building. Did you know that you can prevent this damage by inserting devices into your electrical circuit designed to protect electrical equipment from voltage spikes. A surge protector attempts to limit the voltage supplied to an electric device, blocking or shorting to ground any unwanted voltages above a safe threshold. As part of your risk management, you may identify hazards as a result of surges that will pose a risk of injury and/or damage to the infrastructure. Dangerous sparking can result in fire and electric shock hazards, as it presents a risk of flash-over, where the voltage present creates an over-voltage. Installing a surge protection system for your building offers protection for your electrical installation and electronic devices. 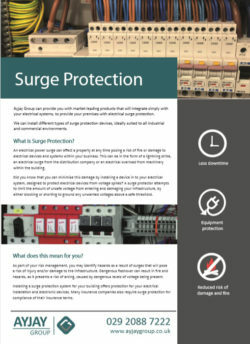 Many insurance companies also require surge protection for compliance of their insurance terms. Carrying out Preventative Maintenance (PPM) will enable us to detect thermal and electrical pre-damage of all arrester elements. Through checks we can identify any damage caused by past power surges and enable correction for consistent future cover. If you would like to arrange a preventative maintenance plan, or discuss any of the above, contact our team on 02920887222.